One of the worst things at a barbeque is dried out burgers. We've all been there. 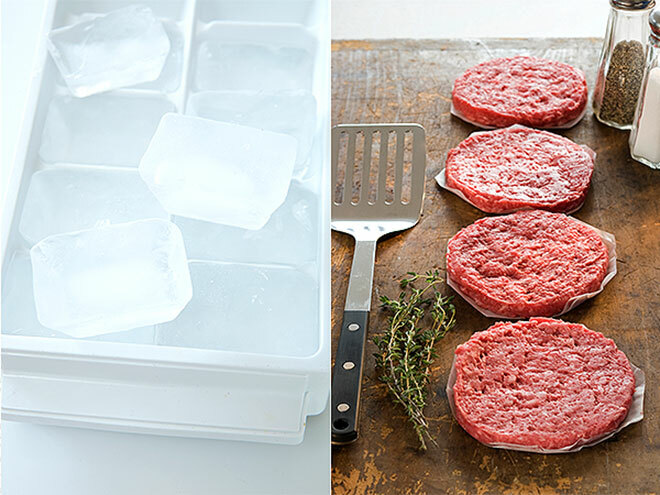 One way to keep your burgers moist on the inside is to add a single ice cube inside the patty before cooking. To ensure the ice doesn't melt and soak the meat, assemble the patties right before you put them on the grill. As the burger cooks, the ice cube will dissolve, leaving the inside of the patty moist and the outside crispy. There are certain herbs that can be placed directly over hot charcoal to infuse your food with a subtle flavor. Rosemary is really great. Its thick, woody stems means that it will burn longer than more delicate options. It's also considered a natural mosquito repellent and will make your yard smell incredible. Of course you know that your trusty Foreman is just the thing to keep your cold drinks nice and frosty but put that double-walled insulation to good use by hacking your cooler into a meat warmer and keep that pulled pork or brisket you made in advance warm. A handy trick to start a fire quickly is to use a cardboard egg carton. 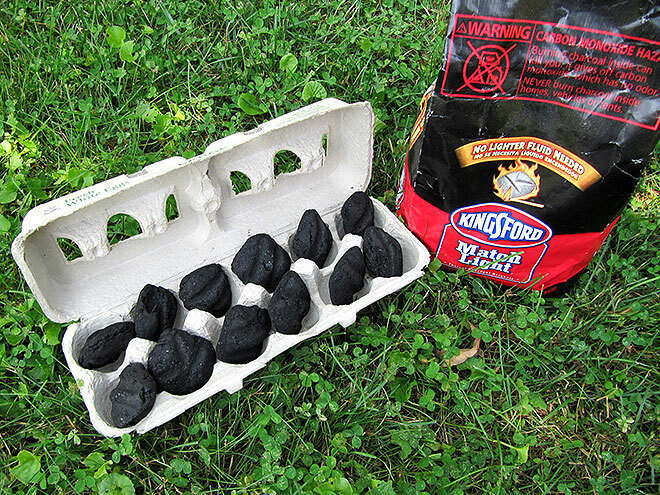 Place one charcoal briquette in each egg slot. This technique puts the kindling and coals into close proximity. You can make up several cartons and keep them on hand to take with you when you go camping or to have one hand for those last-minute marshmallow roasts. 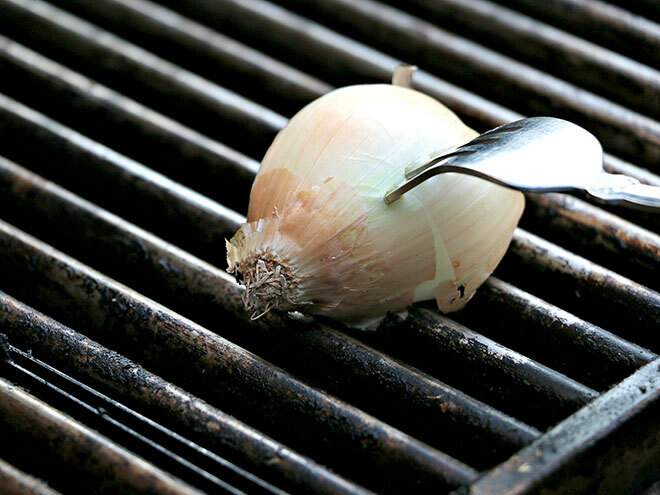 Of course you can use a special tool or tongs and a ball of aluminum foil to clean up your grill, but you can also scrub your grill with half an onion. Not only do the veggie's ridges help loosen stuck-on grime, it helps give a mellow onion flavor to whatever you're grilling next. If you're planning to cook for several guests, write their order in ketchup on one side of a bun to keep your orders straight. You can store all your favorite condiments in one convenient place in a six-pack container and keep them in the fridge until you are ready to head outside. If you are grilling smaller items like shrimp or vegetables, two skewers are definitely better than one. 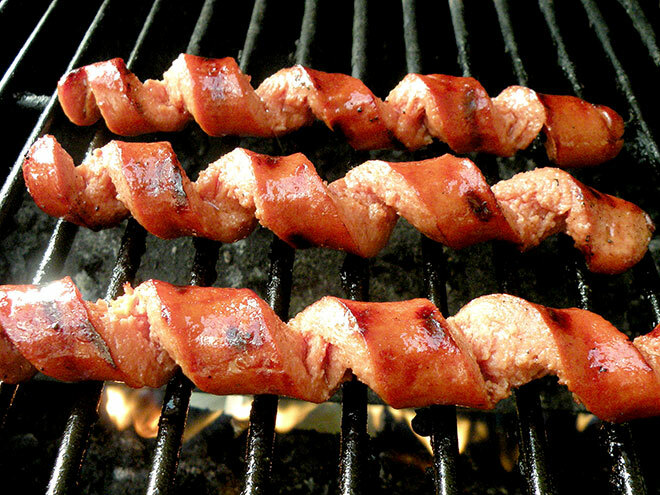 It keeps them from rotating around the skewer when it is time to flip. It also ensures even cooking and makes basting easier. Why might you do this, you ask? WHY NOT?! It is cool, that is why! I guess if you want a real explanation it could be that it creates more surface area for you to get charred, caramelized meat while creating nice little pockets for your sauces and condiments. Ever had the frustration of ruining a gorgeous piece of fish because it either all stuck to the grill (or even fell all the way through)? Well, never again with this little gem of a tip. Make a bed of lemon slices and place your fish on top. Not only the does the fish come off the grill easily, but it will easily pick the some of that delicious citrus flavor as it cooks. I hope you have enjoyed some of these tips as we come upon grilling season once again. Let me know any of your own favorite tips or tricks you use when you grill in the comments below!